is the last impression. You only get one chance to make a great first impression! Before you approach an investor, here is some action you can take to maximize your chances of clinching the deal. Do you have an adequate team behind the concept? Do they have the experience to take forward? Unfortunately, just having a great concept isn’t enough. This is one of the greatest considerations for an investor. Many times, inept teams have let down some businesses. On the other hand, there are also many instances where great teams have achieved phenomenal success with an average idea. It takes immense effort to both launch and run a business; and it’s the strength, expertise and experience of your team that will determine how you can do that. Building a team with experienced professionals with skills is critical, especially if you are looking for striking a deal with an investor. So, pay attention to some points: like analyze your business critically and identify exactly what skills and experiences are necessary to succeed. Then, evaluate your team and identify what skills are available, and which are lacking with your current team. Before setting up your first meeting, have a strong team in place, that has the requisite experience needed to keep the business afloat! You may have a great investor pitch, but the data and numbers behind your business will always impress. If businesses or startups have to be funded, they need to have traction and momentum. With real customer data, you can prove that you have built the right product for the right market. Traction doesn’t mean earning crores in revenue or generating thousands of active customers. Simply, it means that you were able to successfully progress your business given the limited resources that were available to you. So, before you meet with investors, validate that you have developed a true product-market fit by: launching a minimal viable product and putting it to the test; also finding consumers amongst your target audience and generating feedback; and also tracking customer behavior and optimizing your product/service until you have developed the ideal product that customers need to solve their problem. Frankly, validation confirms that there is a true demand for your product. Besides, it also demonstrates that you can successfully generate a return on resources. When they see that you have accomplished a substantial amount with very little, investors will be more confident that you can also provide a significant ROI. Pumping in funds can help you rapidly scale your marketing strategy. But, first, you must test your marketing strategy – to ensure that it is both optimized and scalable. Investors expect that you have an ascendable plan in place, so that their funding will be used to grow your business. So, before you set up your first meeting, it is critical that you identify who your market is and know how to reach them most effectively: put your marketing strategy to the test by launching small-scale campaigns and optimize these campaigns until you have the ideal cost per acquisition and, are able to easily bring in new customers, while maintaining a positive profit margin. As you test your marketing strategy, you will be able to generate the statistics that you need to build a solid case. After surveying the situation and collecting all the statistics that matter, you’ll need to create a pitch that explains exactly why they matter. And, how should your pitch be? – concise but detailed; informative but persuasive; and most of all, memorable. – should detail the story of your business – who the market is, what problems they face, what your solution is, and why your solution is the right solution. It should also describe why you have the right team, the right product (through product validation) and the right strategy to move it to the next level of success. Always remember that some investors hear a number of pitches every day. In order to stand out, you need to be better than the others. This means having a stronger team, more notable achievements, better validation and a more scalable product. Remember, when it comes to securing funding, it all starts with the pitch. The day of your pitch may be the first time you actually meet the investor. But, it is important that you should do a thorough check-up on the investor, so that you are already clearly familiar with their background. Knowing who you are pitching to is almost as important as knowing what you are pitching. Doing research before pitching, gives you a tremendous advantage. Striking a deal isn’t just about presenting an awesome business but, it’s about finding the perfect startup-investor partnership. The more you know about the investor before the pitch, the better you will be able to optimize your pitch for them. 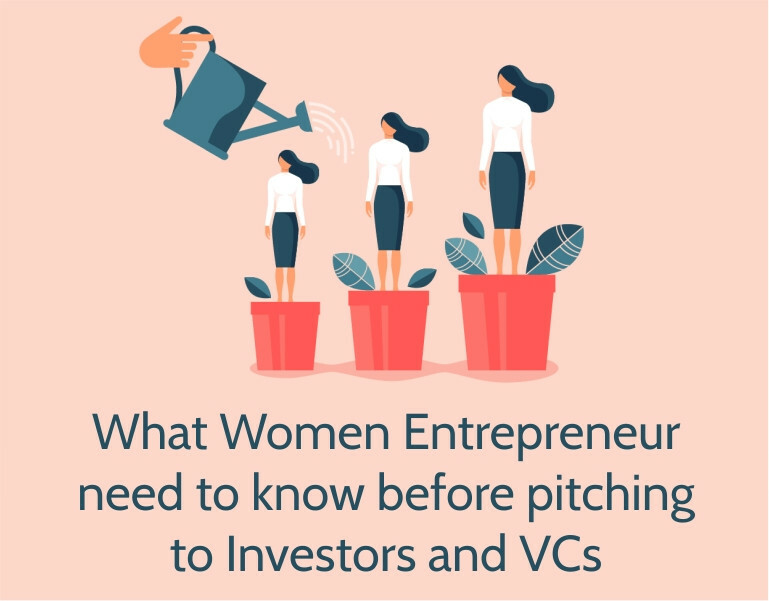 Women entrepreneurs need to network in the startup and investing community consistently so they can learn what investors are seeking. Sometimes investors host several investor events on a regular basis, which can provide value for entrepreneurs seeking funding. So, keep a watch out and participate, for you will be the gainer! Once you have successfully accomplished all the above steps, you will be able to confidently walk in and pitch to any investor. Backed by a strong team, a great product-market fit, the right strategy, and a perfect pitch, nothing should stand in your way of accomplishing your funding goal. And, during your fundraising journey, you may just about win against the odds! Do not think of gender as a disadvantage. Investors rely heavily on your ability to believe in your own leadership capabilities. Present yourself with confidence and pitch yourself with full power!